The crowd let out a few chuckles, but the laughs became fewer as the speaker’s words turned stark. The speaker was Congressman Brian Fitzpatrick, who joined the Doylestown Rotary Club’s early morning meeting on Tuesday, March 27, to talk about the key issues he’s been focusing on throughout his term. The issue that haunts him the most? The opioid epidemic that’s been plaguing communities in Pennsylvania for years. 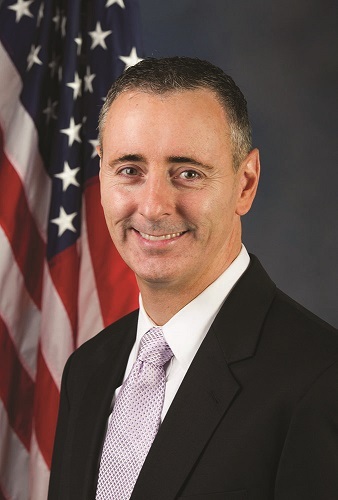 Brian Fitzpatrick is the incumbent for the eighth district, which after court ordered redistricting, is now the first district. The eighth district was a swing district, meaning it could go either democrat or republican. However now the first district includes more democratic territory, making Congressman Fitzpatrick’s re-election that much more competitive. Currently, Fitzpatrick has his party’s backing for the primary election taking place in May, but he’s also facing off against fellow republican Dean Malik. As for the Democrats, three have emerged to try and unseat congressman Fitzpatrick. Rachel Reddick, Steve Bacher, and Scott Wallace. Wallace has the Democratic Party’s backing. The congressman met the small but eager crowd to speak about what he’s mainly been focusing on throughout his term as congressional representative for the eighth district. As his term dwindles down and he faces re-election, Fitzpatrick told the crowd he’s still standing firm on three issues; the opioid epidemic, school safety, and cyber security. Congressman Fitzpatrick then reminded the crowd that over the weekend three Pennsbury graduates had lost their lives to opioid addiction. As to how Fitzpatrick wants to “stop the bleeding” with the opioid epidemic, he said he wants to start with the education our schools provide on the matter of drugs, drug addiction, and mental health. Fitzpatrick also said police are overwhelmed by the epidemic, and in order to help the problem they must be provided with the proper tools. “I was visiting the Bensalem police department the other day and a drug bust they just did wiped out almost all of their already tight budget,” Fitzpatrick said. “In the age of terrorism where physical acts of terror are being committed, people downplay the harshness of cyber security, but don’t be fooled, a breech on cyber security can cut a democracy off at its knees and destroy an economy.” Fitzpatrick warned. The Problem Solvers caucus is a bipartisan group in the U.S. House of Representatives with about 48 members that all specialize in coming up with bipartisan solutions on key policy issues. Despite expressing how we need to talk about the issue, Fitzpatrick didn’t mention the March for Life that had taken place this past weekend. The crowd, delighted with his invitation, then wrapped up the meeting and gifted their guest speaker of the morning with a Mercer Tile with the club’s symbol on it. The crowd thanked the congressman, and the meeting was adjourned.